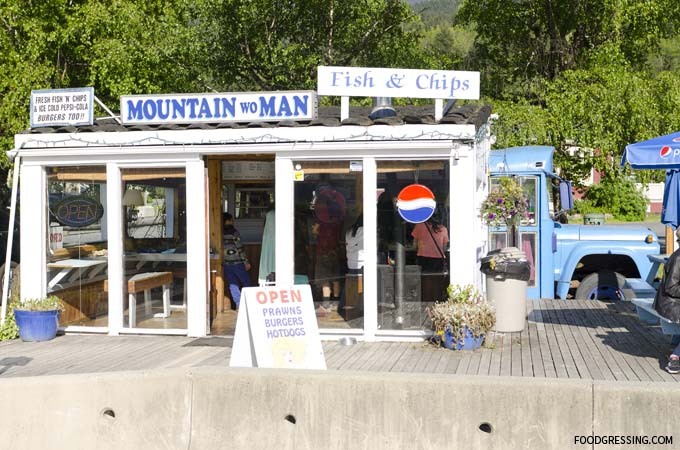 On our day trip to the Sea to Sky Gondola, I had noticed what appeared to be a shack with a large sign advertising that they serve fish and chips. I was curious about what they offered and a quick search on my phone showed that the eatery is named Mountain Woman Take-Out. Their ratings were pretty good on various review sites, so I made it a point to stop there on the way back to Vancouver. 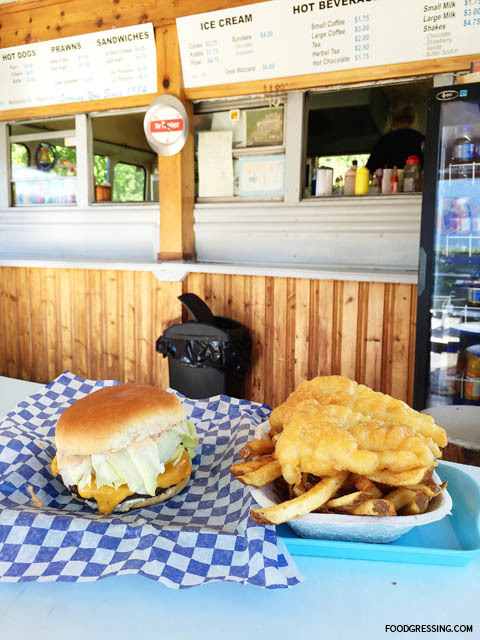 Located on Highway 99 in Britannia Beach, Mountain Woman Take-Out is a fast-food eatery serving fish and chips, burgers, ice cream and more. 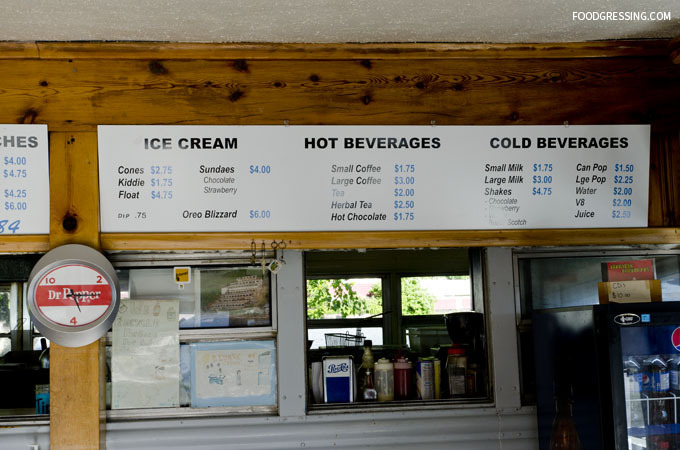 The eatery has been in business since 1984 and operates out of a blue bus. Kind of interesting, really – a food truck bus! The owner, which I presume is “Mountain Woman,” is a friendly lady. She noted to us that the last time the bus ran was over 20 years ago! I came across a Trip Advisor post of Mountain Woman Take-Out written by the owner’s son and it is quite revealing. The eatery was originally named “Mountain Man” after his father. The father later left and so Mountain Woman added “Wo” before “Man” to rebrand the place. Look at the top photo and you will see the smaller size “Wo” added to the sign. Mountain Woman’s son also writes that the bus took him and his siblings to put “hockey, soccer, skiing and Disneyland.” Their mother worked hard in order to provide for them. Very inspiring! 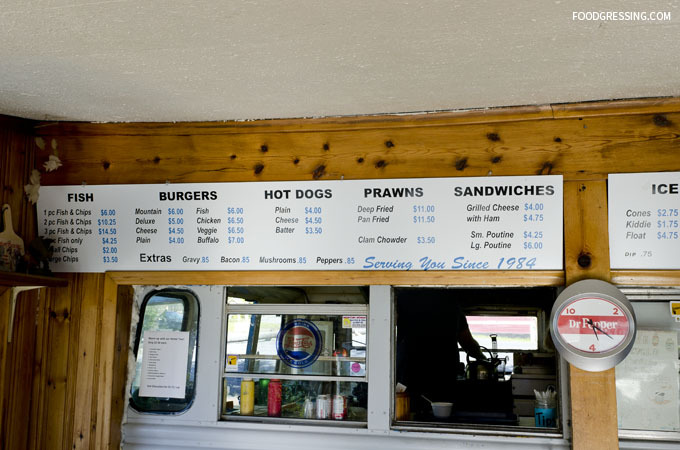 They serve fish and chips, burgers, hot dogs, prawns, sandwiches, milkshakes, ice cream and more. The “indoor” portion of Mountain Woman has a kids table with assorted toys and coloring books. Love how kid-friendly it is and my son instantly took to the toys. 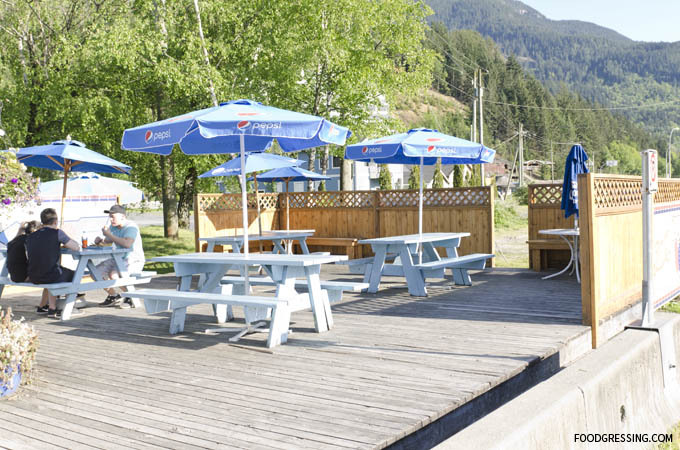 Furthermore, Mountain Woman is dog-friendly as their outdoor patio deck allows dogs. 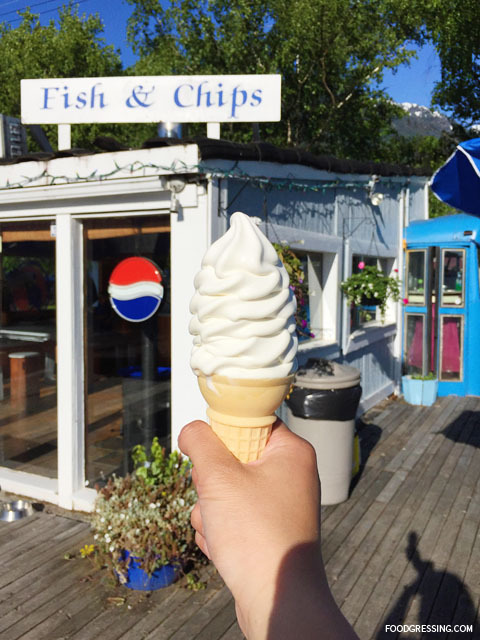 We ordered a two-piece fish and chips ($10.50), a buffalo burger ($7) and a vanilla soft-serve cone ($2.50). The food did not disappoint and were reasonably priced for the size and quality. 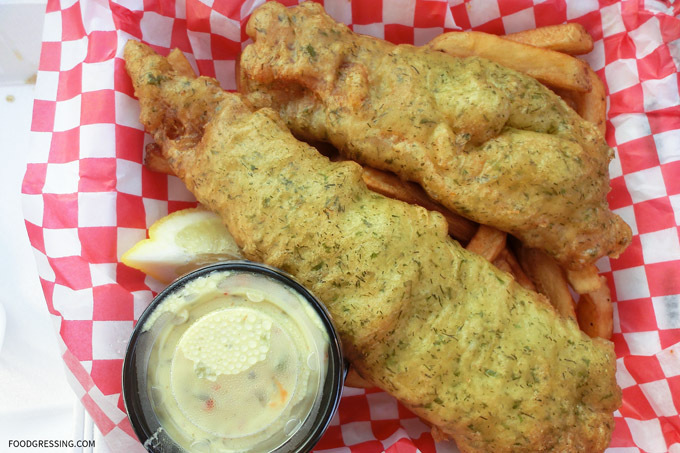 The cod had a nicely seasoned batter which was light and not overly greasy. The fries were golden in colour and very crispy. The buffalo burger was moist, tender and juicy. Most noticeable from the burger was the large slab of cheddar. The vanilla soft-serve was surprisingly not overly sweet and better than one you could get from McDonald’s. 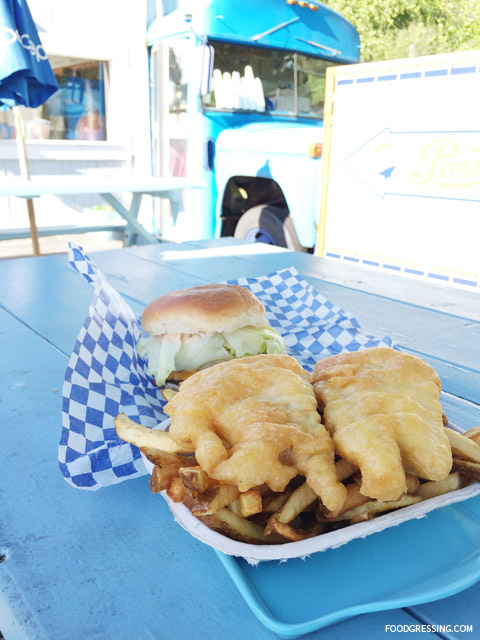 For more Squamish eats, see other posts with the tag Squamish. When my family and I were in Montreal last fall, we decided to visit the Montreal Biodome. Located at the Olympic Park, the Montreal Biodome has a replicas of the four ecosystems found in the Americas. It was a rather cold day so I wanted to get something quick to eat to warm up. 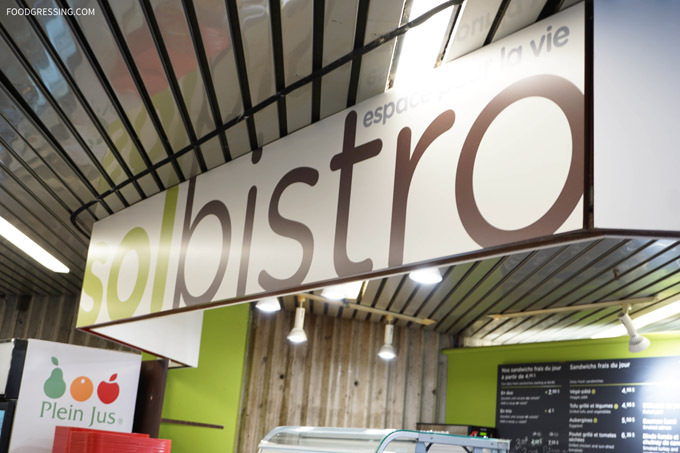 Inside the Montreal Biodome is Sol Bistro, a cafeteria-style cafe which offers sandwiches, salads, paninis, coffee and pastries. 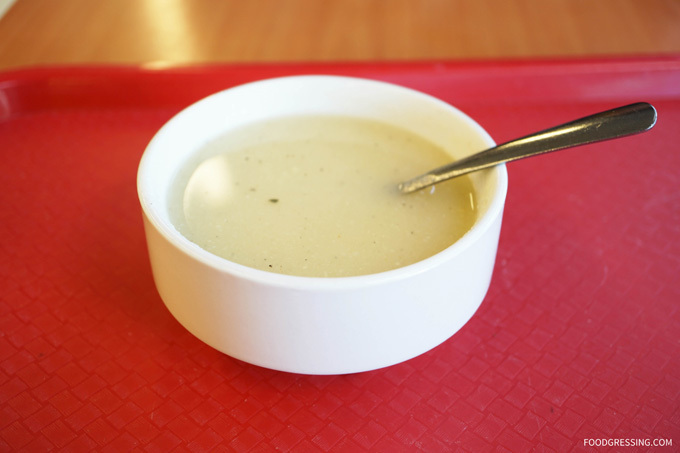 I ordered the soup of the day, potage de panet, – a kind of vegetable soup. It tasted like it had carrots and celery in it. Unfortunately, the soup was just luke warm which really did not satisfy my desperate need for hot (at least warm) comforting soup. 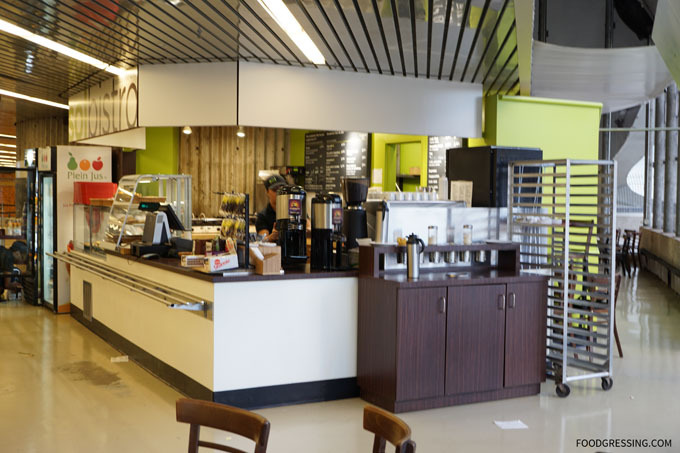 Furthermore, the dining area was heavily neglected because many of the tables had used dishes. It was just overall uncomfortable to sit there to eat with all the uncleared dishes in sight. 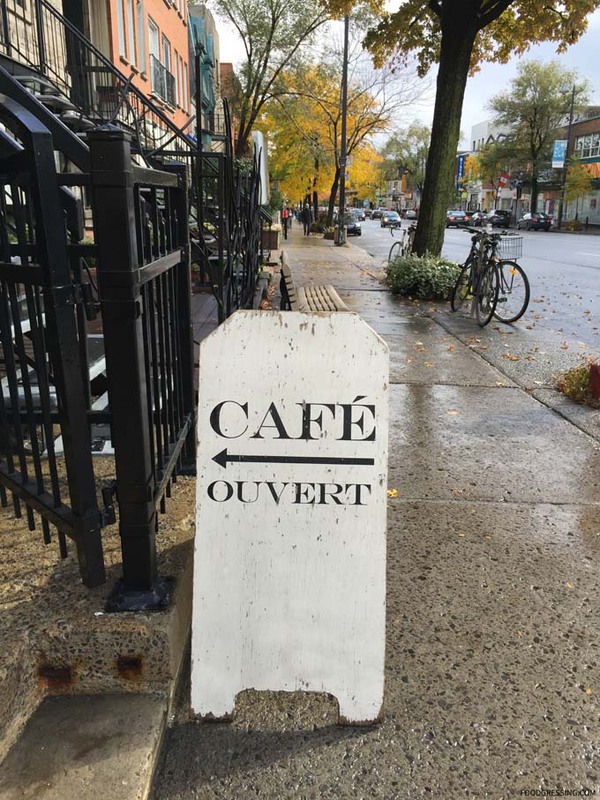 While visiting Montreal last year, I stumbled upon Le Couteau, an artisanal cafe in the Plateau Mont-Royal area. 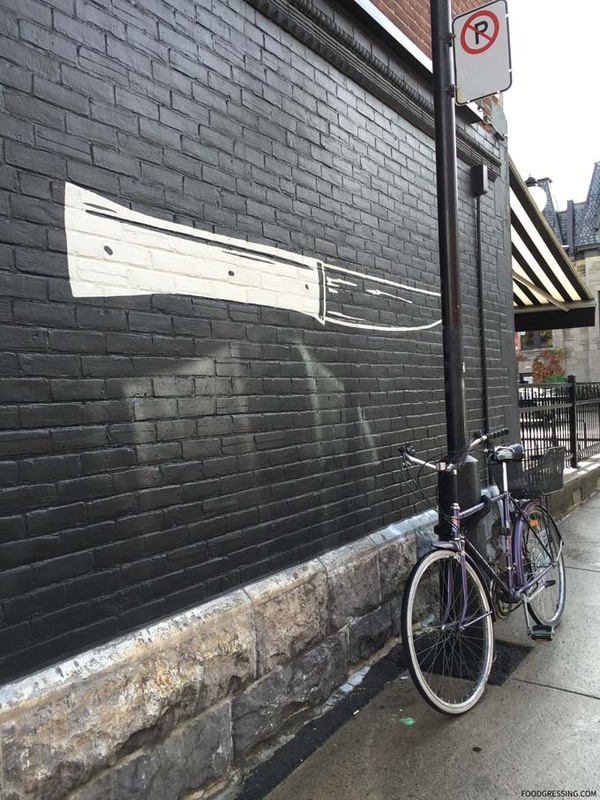 The cafe caught my attention with a very cool graffiti of a knife on a brick wall outside. 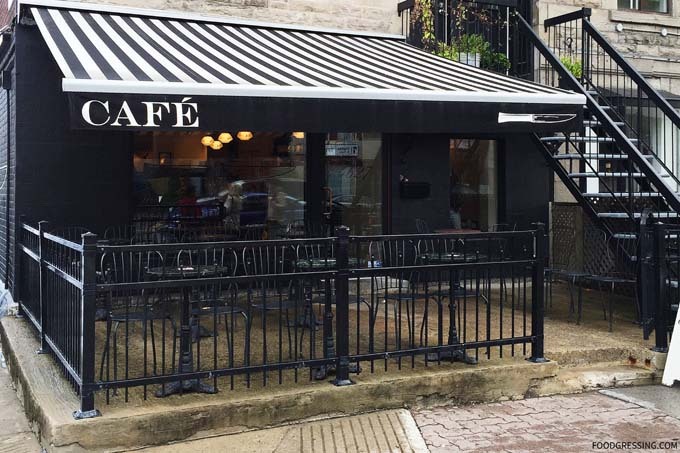 The black and white striped canopy over the patio was rather charming. The very cute exterior enticed me to go inside for a coffee break. 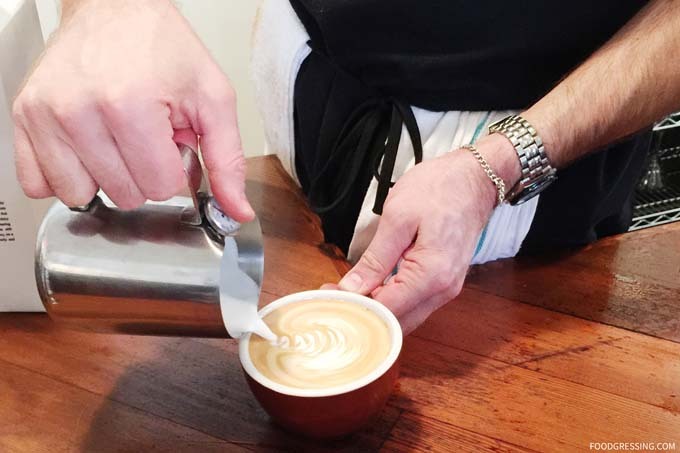 Coffee served at Le Couteau is by 49th Parallel. 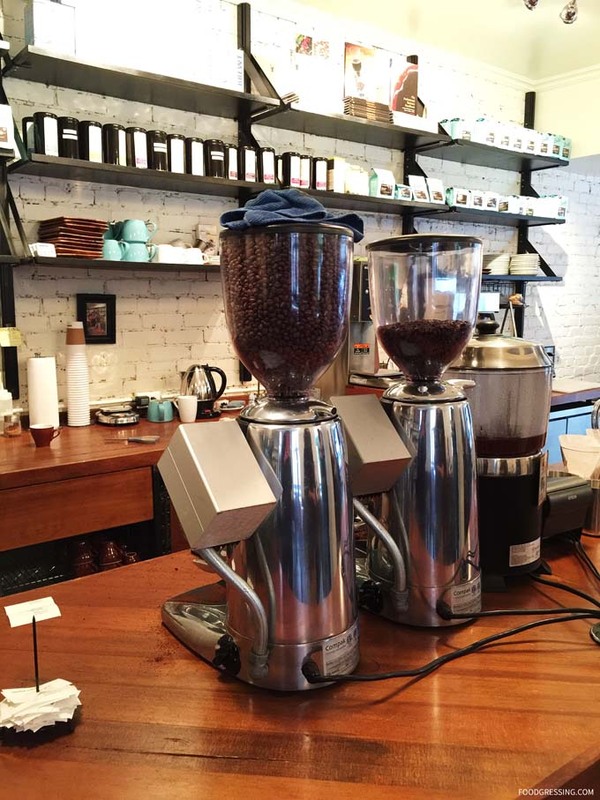 It was interesting to learn that this Vancouver-based coffee roaster was so popular in Eastern Canada. 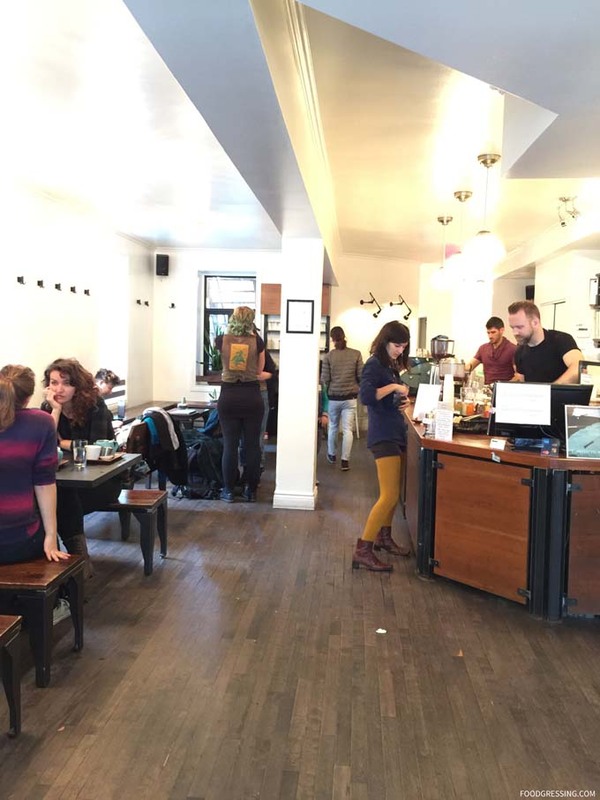 The interior was rather hipster chic with high ceilings, wooden tables and benches. It seemed rather busy at the time of my visit. 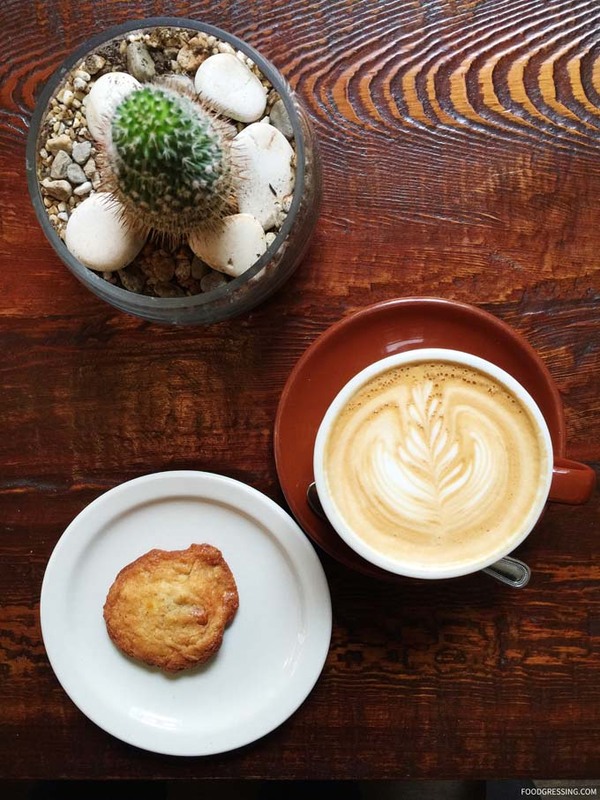 The perfect pairing for coffee is of course a scrumptious pastry. 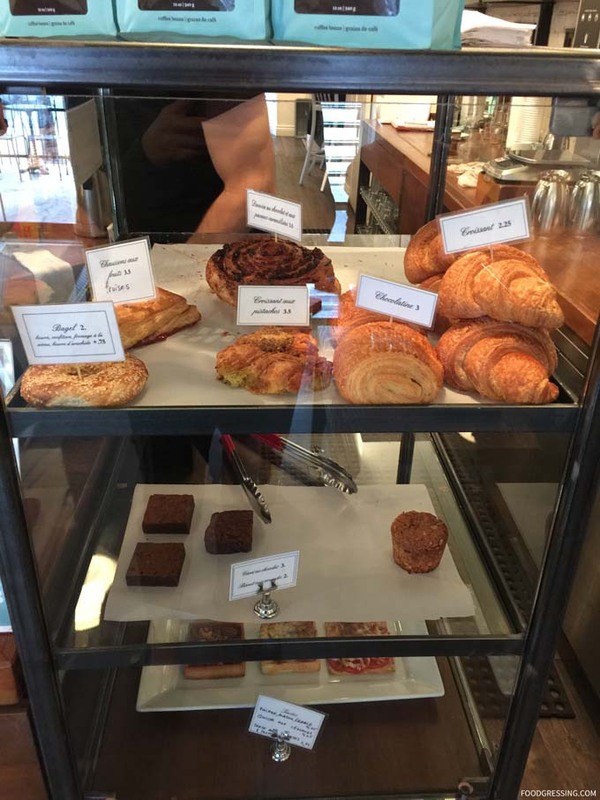 Le Couteau offered a small selection of bagels, croissants, danishes, brownies and more. And a few handmade cookies caught my eye including double chocolate; almond and white chocolate; and apricot, pistachio and dark chocolate. 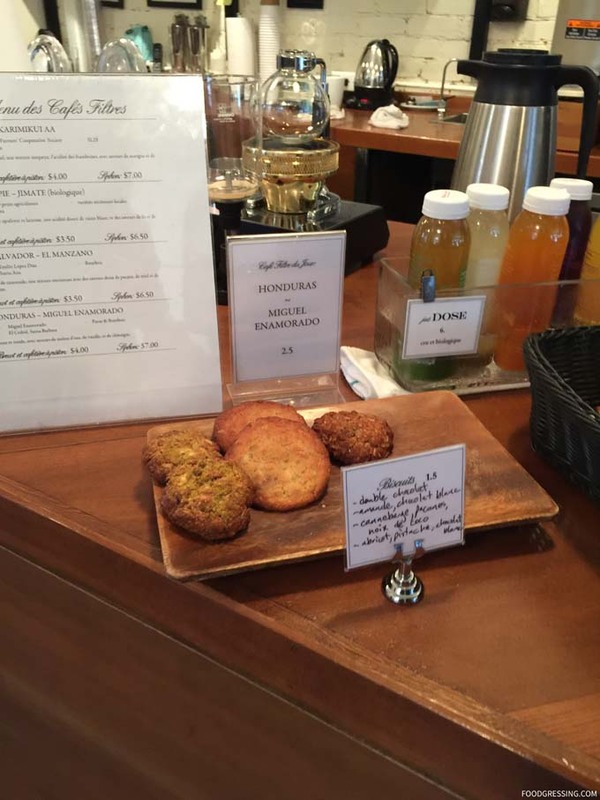 I ordered, quite simply, a latte with an almond and white chocolate cookie. 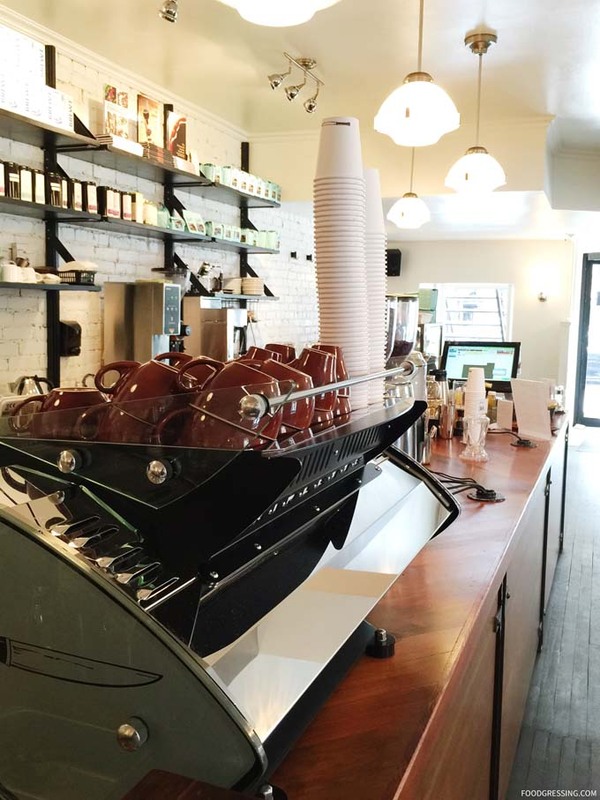 The baristas at Le Couteau were very friendly and seemed to have passion for their work. The latte was very cozy, comforting and at the right temperature. The cookie had a nice almond and white chocolate flavour. 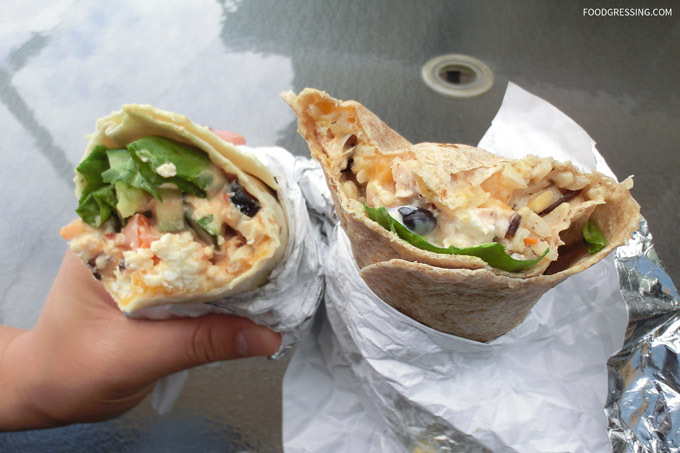 Fellow food blogger, Picky Diner’s, recent food adventures in Seattle inspired me to finally write about my Seattle eats. 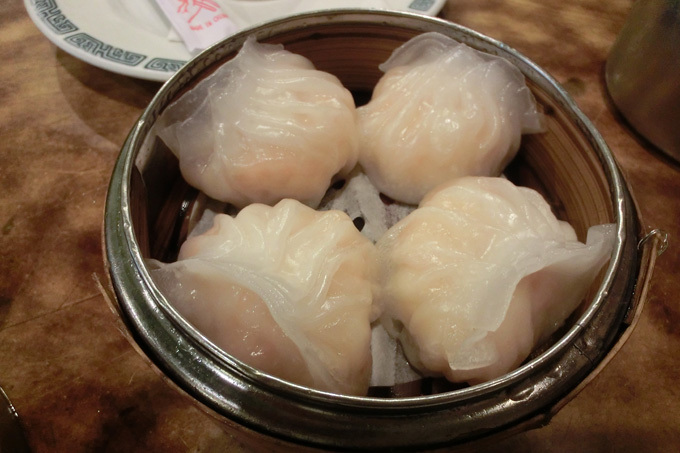 So in today’s flashback Friday post I’m going to share with you my visit to Jade Garden in Seattle. Back in 2012, Bolt Bus had just launched service from Vancouver to Seattle and were offering fares for $1. I took advantage of the deal and did a day trip down to Seattle with my mom. The drop off point in Seattle was 5th Avenue South and King Street which is very close to Chinatown. Feeling hungry after a long bus ride, we ventured to the nearby Jade Garden for some lunch. 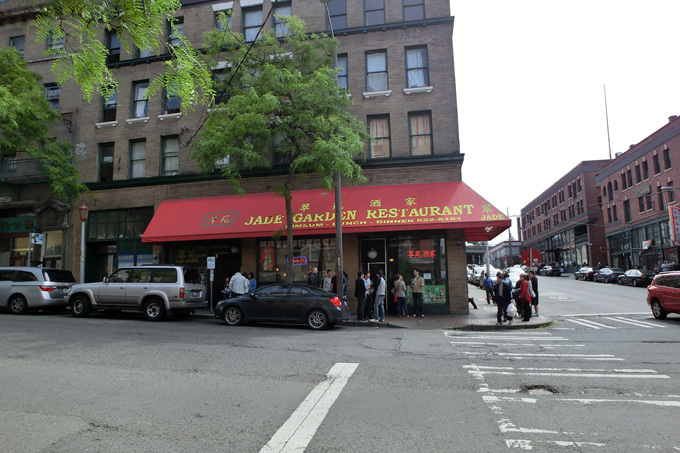 A quick search of Urbanspoon and Yelp on my phone had showed that Jade Garden was one of the top places for Chinese food in Seattle. The popularity was confirmed by the fact that we had to line up though not too long. However, it seemed like there were slowly more and more people arriving. 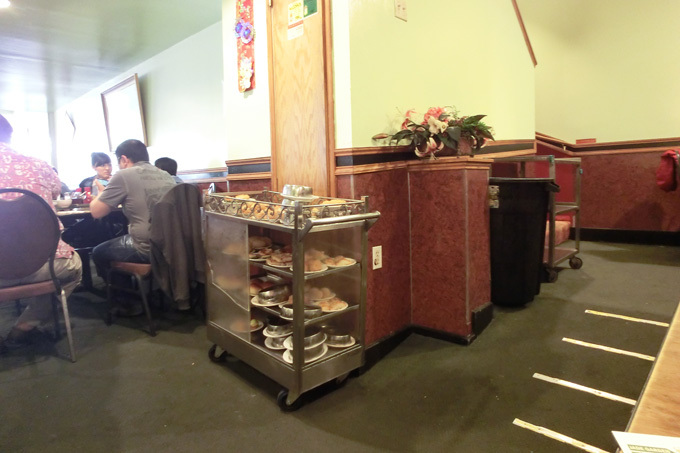 Jade Garden is definitely an old school Chinese restaurant by having dim sum carts. 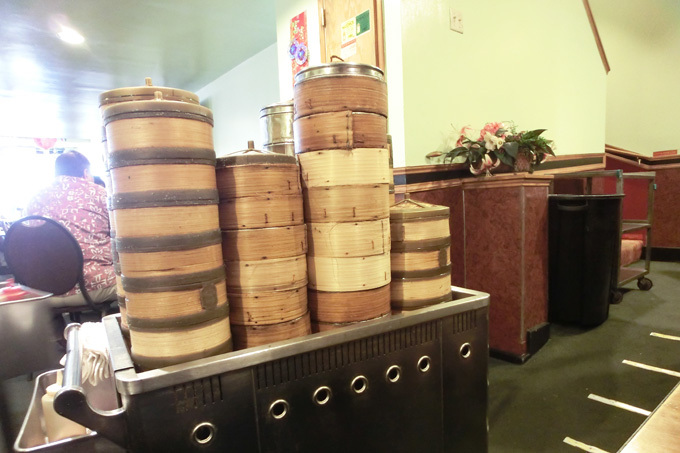 This way of serving food in Chinese restaurants in Metro Vancouver was slowly disappearing. The interior also seemed to be a bit dated. 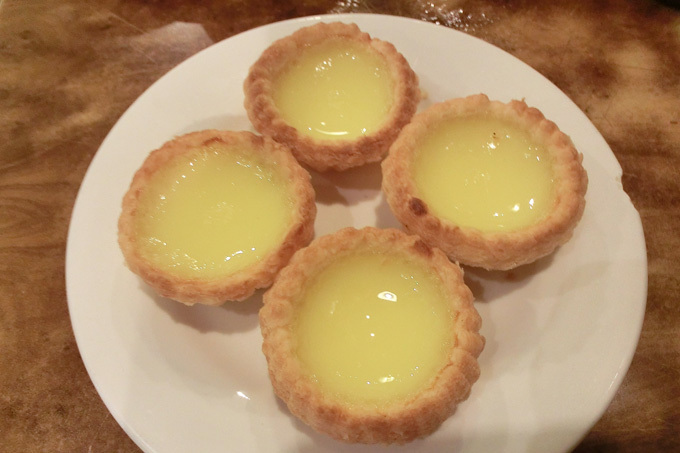 Our meal consisted of egg tarts, pineapple buns, Shanghai dumplings, and shrimp dumplings. 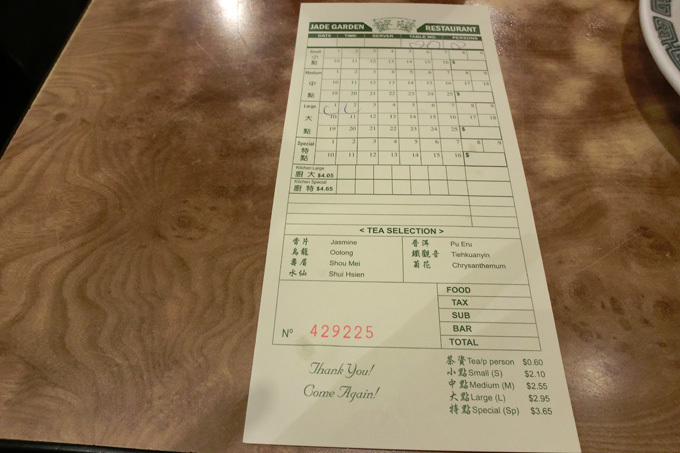 There was a tea charge of $0.60 and the dim sum were priced reasonably at $2-$3. 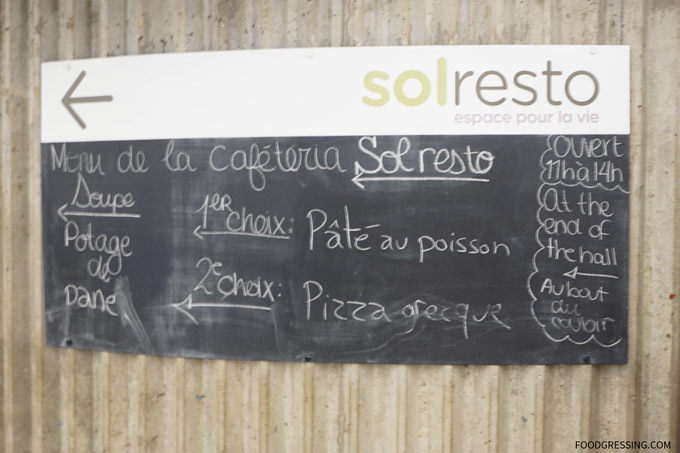 The food in general tasted good though not better than what I had in Metro Vancouver. I give them credit for their decent portions for the price. 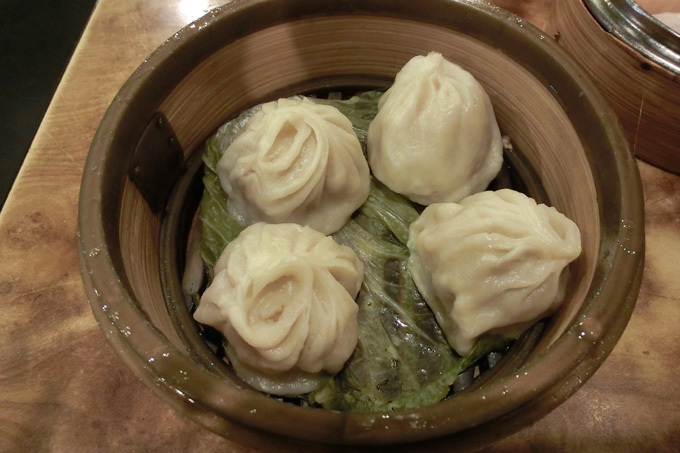 Although the food is not made-to-order, they tasted pretty fresh and was piping hot. 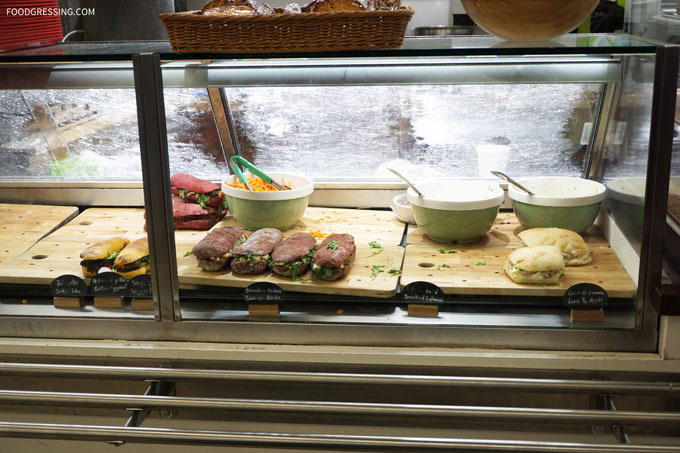 Given the high volume and turnaround, the food probably doesn’t sit on the cart for too long. Service was basic which is what you would expect at these kinds of places. 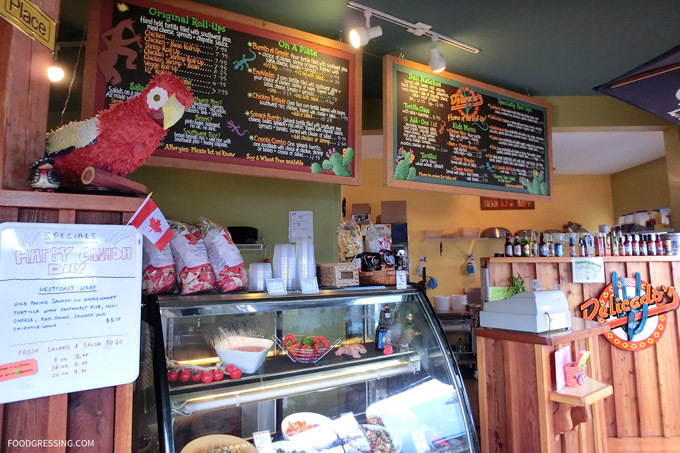 For my Flashback Friday post, I’ll be reviewing my experience at Delicados in Courtenay, BC. Back in 2012, my husband and I travelled around Vancouver Island during Canada Day long weekend. One of the towns we visited was Courtney. We passed by Delicados as we were checking out the area and decided to give them a try for lunch. 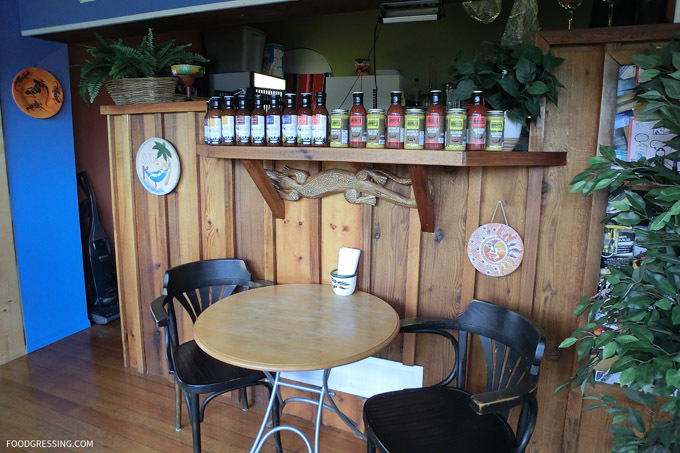 Like Errington Eatery which we had tried on the trip, Delicados was a cozy and quaint small town restaurant. 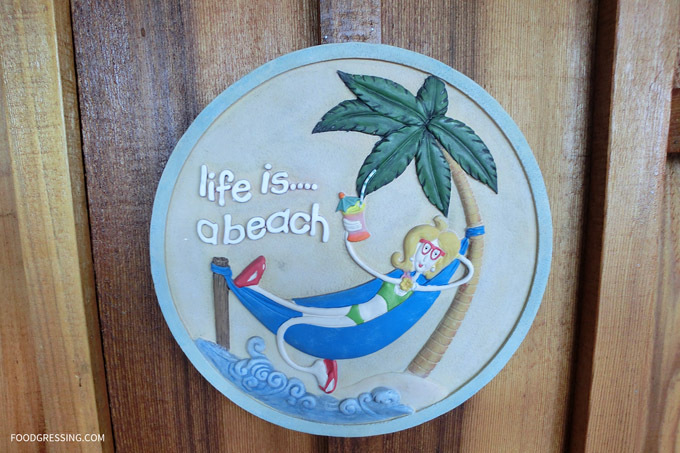 The interior had a sort of beach theme which made the place feel relaxing. 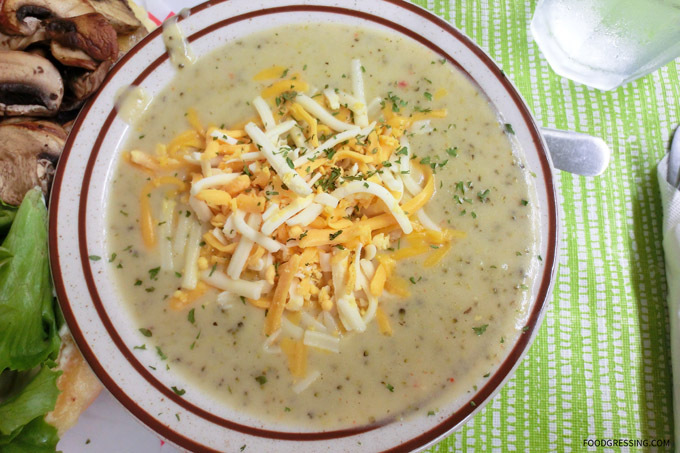 Delicados serves Mexican-inspired food including roll-ups, burritos, enchiladas, tostadas, nachos, salads and soups. Most of the items seemed to be under $10. Since it was Canada Day long weekend, Delicados had a Canada Day special. 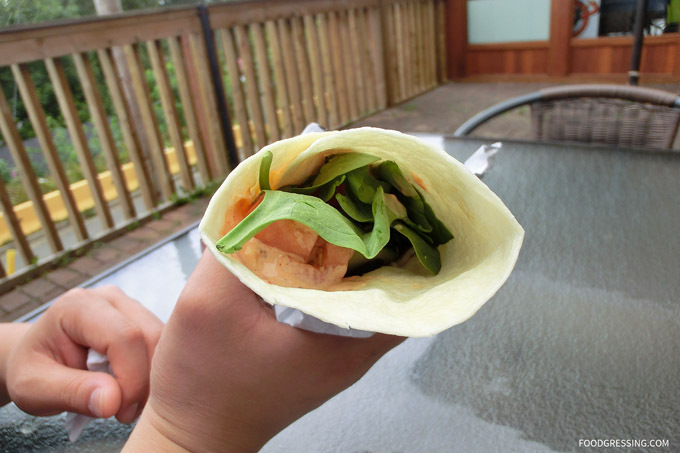 It was a West Coast Wrap ($8.25) with wild pacific salmon on whole wheat tortilla with south west rice, Mexi cheese, red onion, spinach and chipotle sauce. 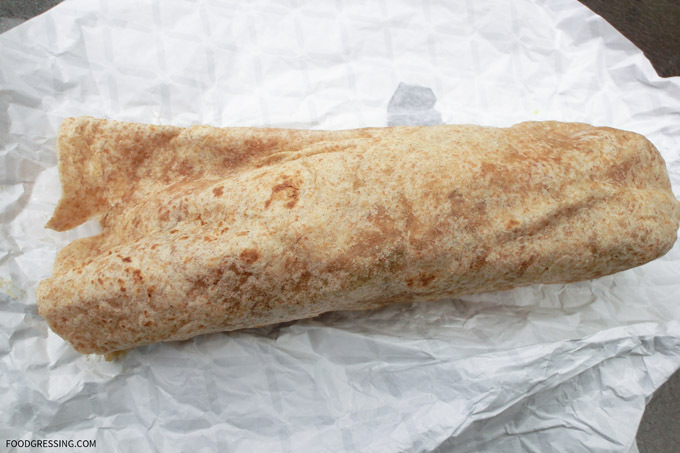 The ingredients tasted fresh overall and the wrap had an overall “healthy” feel. However, we didn’t feel totally satisfied given the portions. Wild salmon is expensive so I think the price was still fair. It’s Throwback Thursday and I’d like to share with you another foodie experience from a few years ago. Back in 2012, my husband and I visited the Parksville and Qualicum Beach area on Vancouver Island. 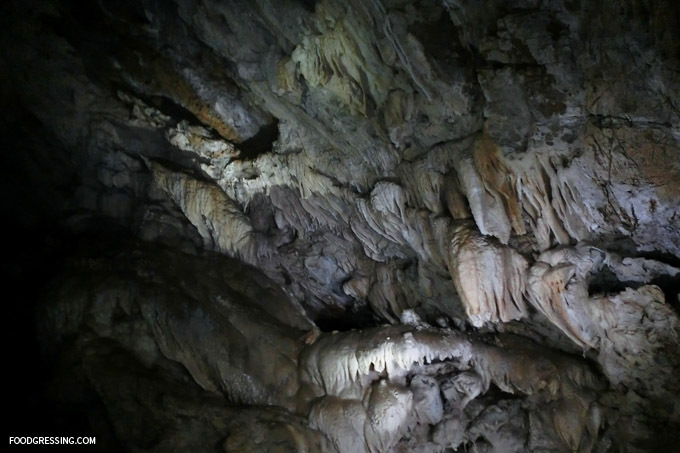 On that trip, we did a cave tour at Horne Lake Caves and as well as some casual sightseeing overall. 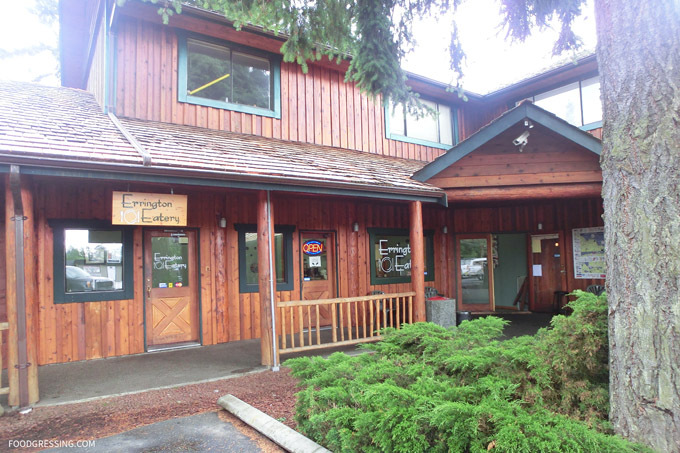 At that time, I used Urbanspoon as a guide to find out good local places to eat and Errington Eatery had a high rating based on the reviews. Because of that, we ventured there to try out their eats. 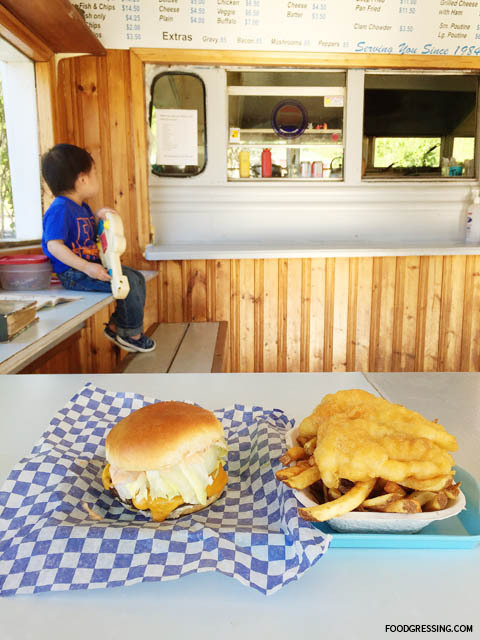 Errington Eatery is a small casual family-run restaurant. Their interior was minimalistic and definitely had a small town feel. 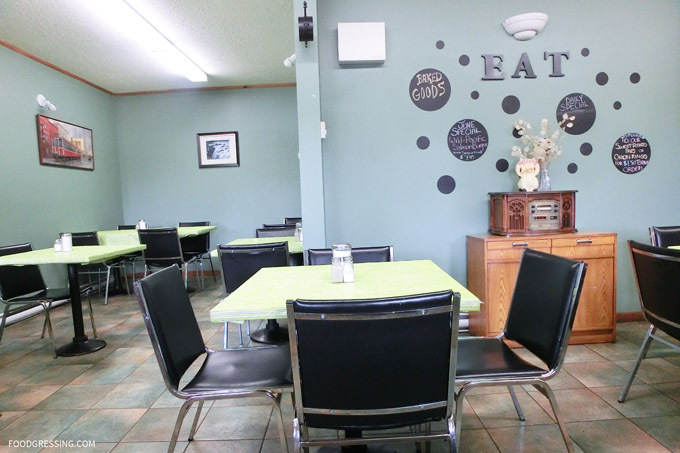 They serve breakfast and lunch items including burgers, soups, salads and pancakes. Most of their items are under $10. My husband went with an Errington Beef Burger Combo with the soup of the day. 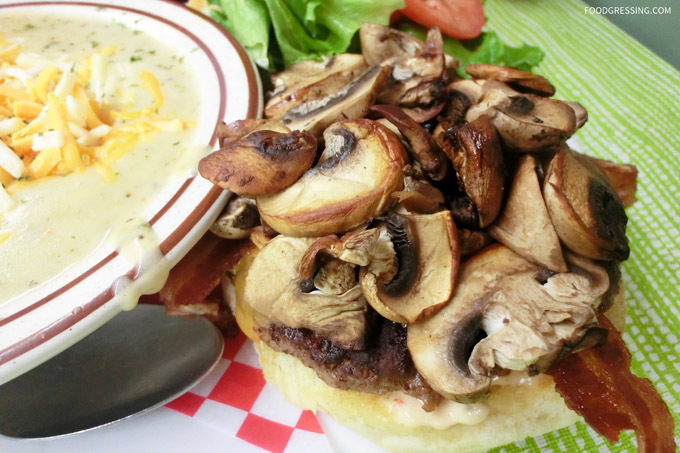 The burger was loaded with mushrooms and he thought that it tasted pretty good overall. 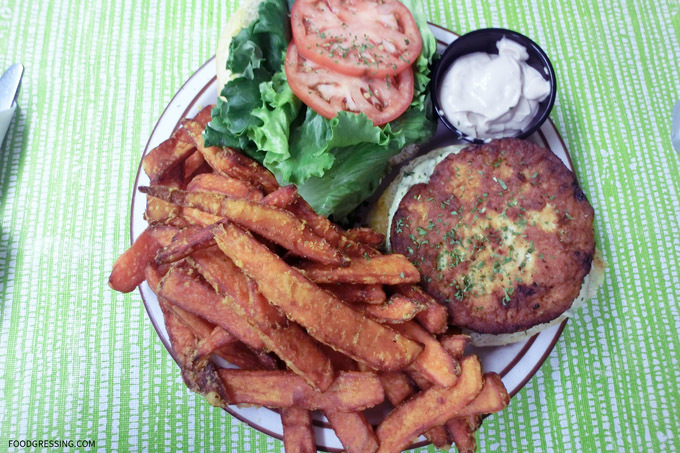 I went with a cod burger and paid extra for the sweet potato fries. Everything tasted good for the price and portions. 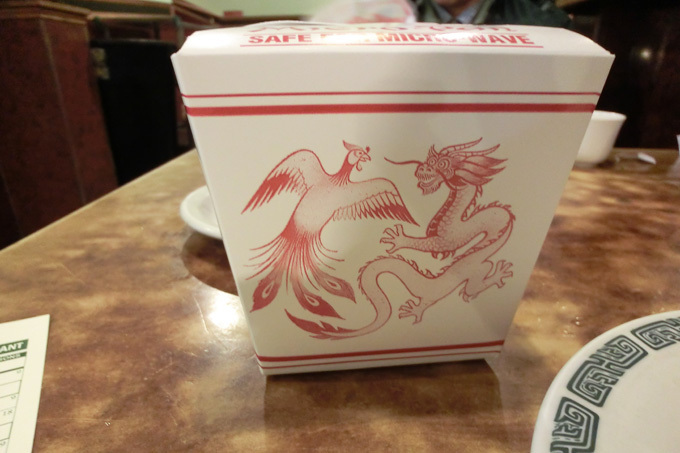 Because we enjoyed what we tried, we went back the next day for some takeout. This time, we had a two-piece fish and chips. The batter for the fish wasn’t the crispiest but still okay. We also ordered a large poutine which was huge! 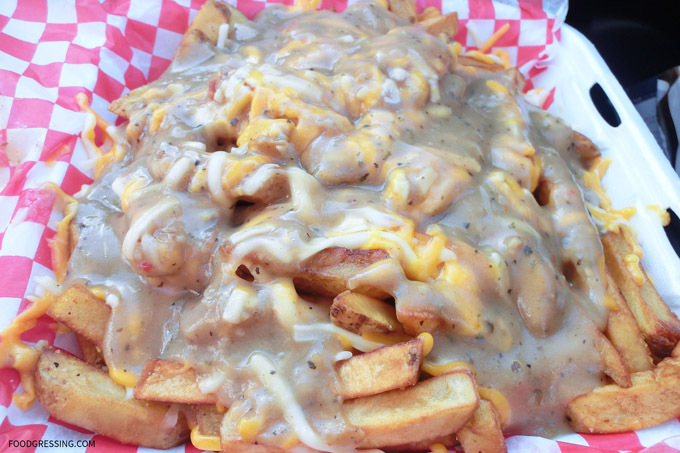 The poutine wasn’t exactly authentic: no cheese curds here but rather just melted cheese. I still appreciated the portions but the gravy was a tad on the saltier side. On a side note, spelunking was pretty fun. It’s Throwback Thursday today and I want to share with yet another memorable past foodie experience. 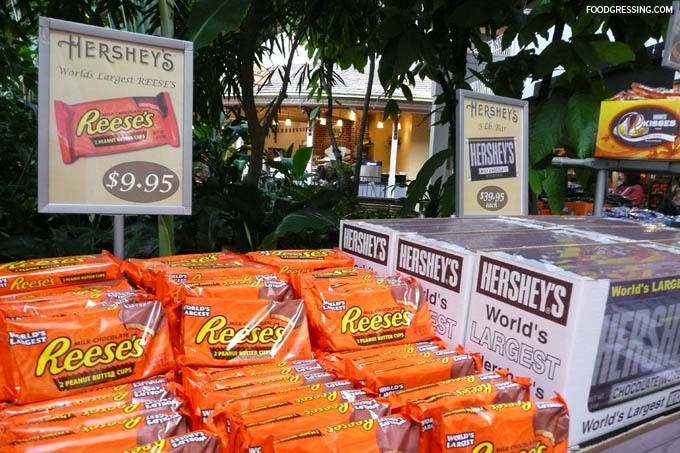 This time, the food adventure takes place at the Hershey’s Chocolate World Attraction in none other than Hershey, Pennsylvania. In 2010, I was on a vacation tour of the US East Coast travelling through several different states including New York, Philadelphia, Massachusetts, Washington DC, Virginia, and Pennsylvania. One of the tour stops was the Hershey’s Chocolate World Attraction. 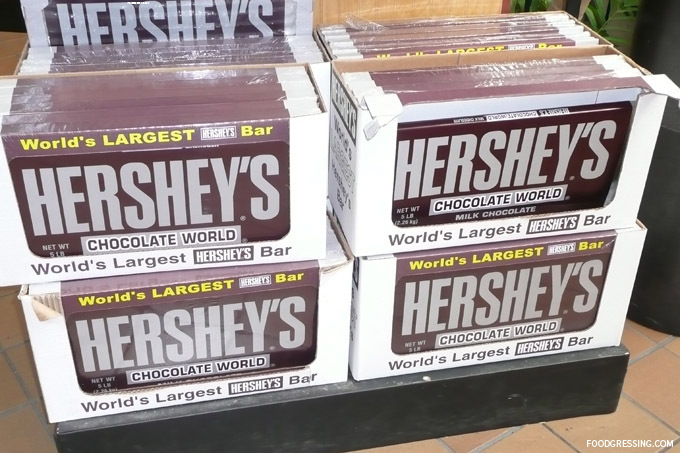 I grew up eating chocolate from the grocery store including the Hersheys’ brands so it was a real *treat* to be visiting Hershey’s Chocolate World. I definitely had my share of Reese’s Peanut Butter cups. When you are visiting Hershey’s Chocolate World, you most certainly need to go on the free Chocolate Making Tour. It is a basically a ride where you get to see the process in which they make and package their chocolates. 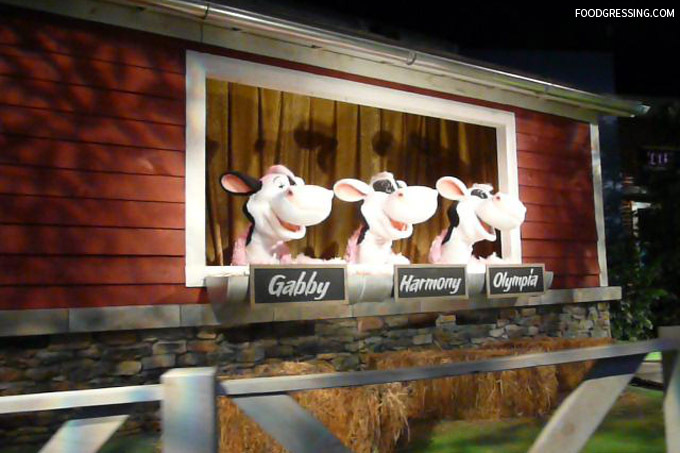 I have to say that the ride is super cheesy and happy including more than enough singing cows but it’s all good fun. At the end, you get a free piece of chocolate. They also take a photo of you while you are on the ride and you can purchase it at the end if you wish. I would definitely recommend going on the tour, however it is currently undergoing renovations until later this year. It is also hard to miss what seems like mountains of chocolate and endless displays of Hershey’s merchandise. The merchandise seemed a bit expensive but not unexpected in a tourist attraction. I was in awe of those supersized chocolate bars! 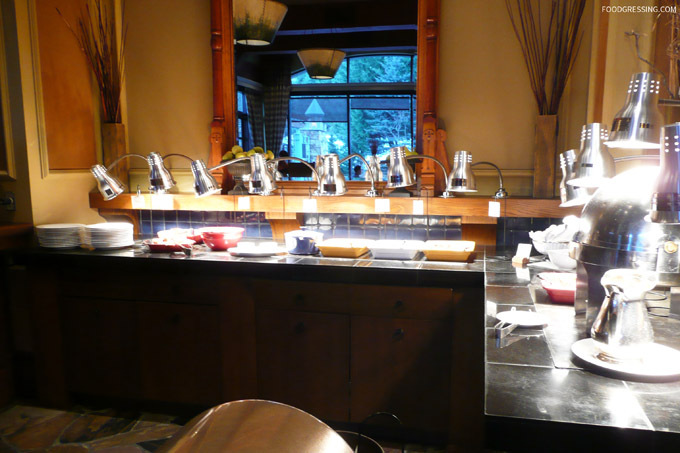 Today, I want to do a Throwback Thursday post on one of my favourite dining experiences in Whistler. About seven years ago, my husband and I stayed at the Fairmont Whistler during a ski vacation. 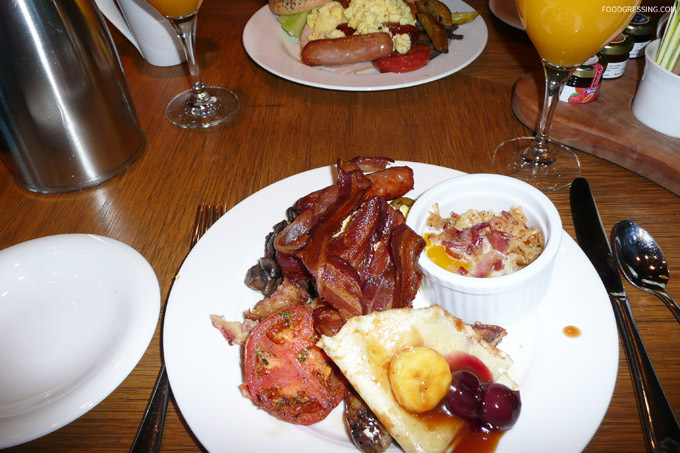 During our 2-night stay, we went to the Wildflower Restaurant located inside the Fairmont for their breakfast buffet every morning. Since the Fairmont is synonymous with elegance and luxury, the dining experience at the Wildflower was just the same as well. I remember the price per person being around $30 when I visited in 2009. The good news is that they still charge about the same: $34 per person. 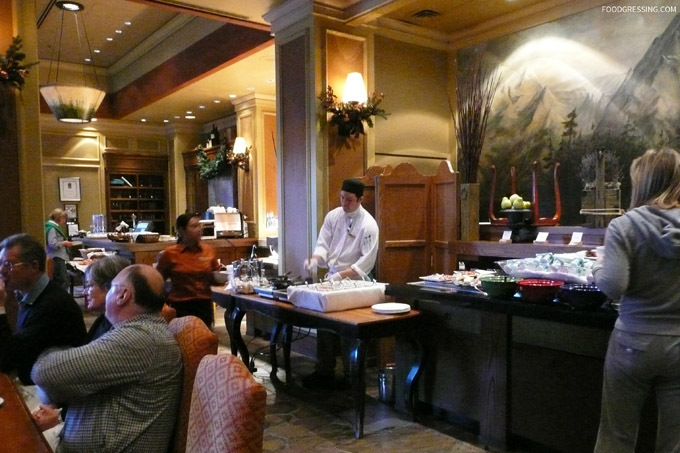 The selection was excellent and I really loved having the two chef stations for the carved ham and omelettes. My husband loaded up on bacon (I mean, protein!) needed for our day on the hills. Aside from the delicious hearty buffet, I really enjoyed the warm and inviting ambiance of the Wildflower restaurant. Futhermore, you get a lovely tableside view of the mountain which makes a beautiful backdrop. Service also was first class and I was also impressed the politeness of the staff. I wouldn’t have expected anything otherwise from the Fairmont. 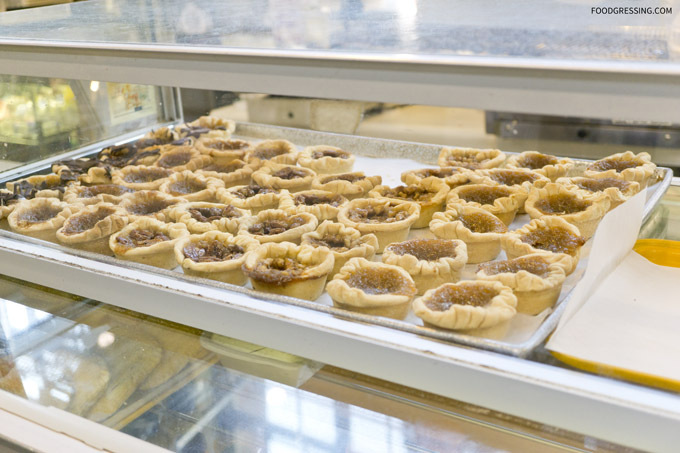 It is without a doubt that you will get hungry while visiting the St. Lawrence Market in Toronto. My husband and son are croissant lovers so we decided to pick up a few for snacks when we were there. 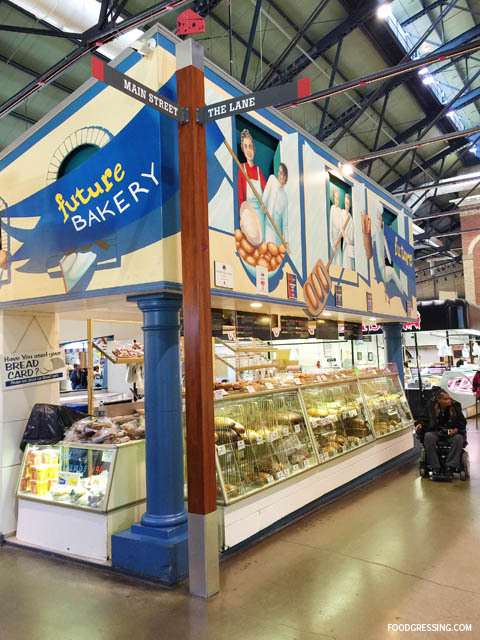 Future Bakery at the St. Lawrence Market seemed like a promising food stall with its tasty display of baked goods. 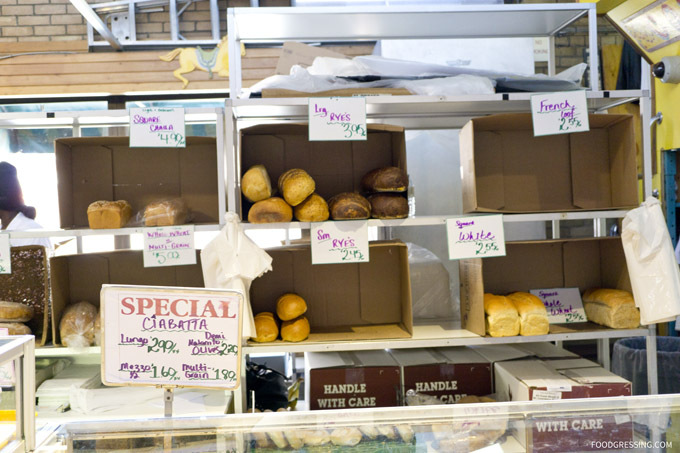 Future Bakery also sell fresh dairy products including cottage cheese, sour cream and Lithuanian Cheese. 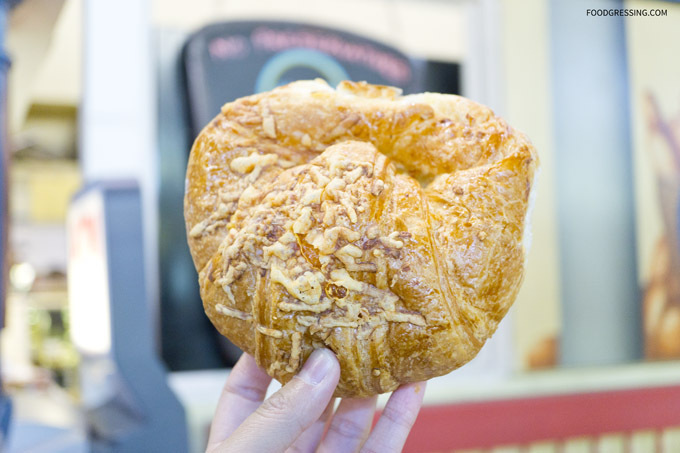 We picked up two croissants: one cheese and one chocolate. Both were priced reasonably at around $2 and were quite decent in size. I found the croissants to be be more or less average. 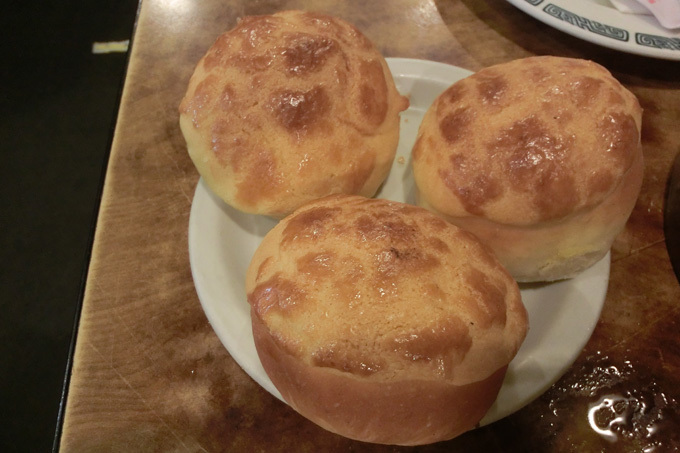 They were reasonably buttery and flaky on the outside and soft on airy on the inside. 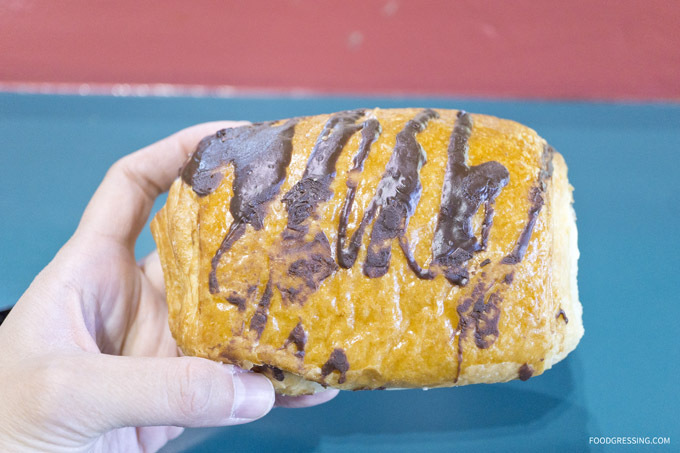 I thought that the chocolate croissant could be sweeter. 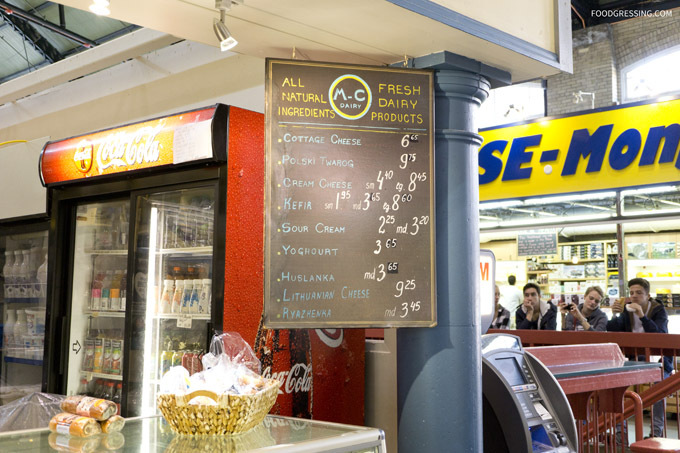 On my trip to Toronto last fall, I made pilgrimage to the St. Lawrence Market – birthplace of the famous peameal bacon on a bun. 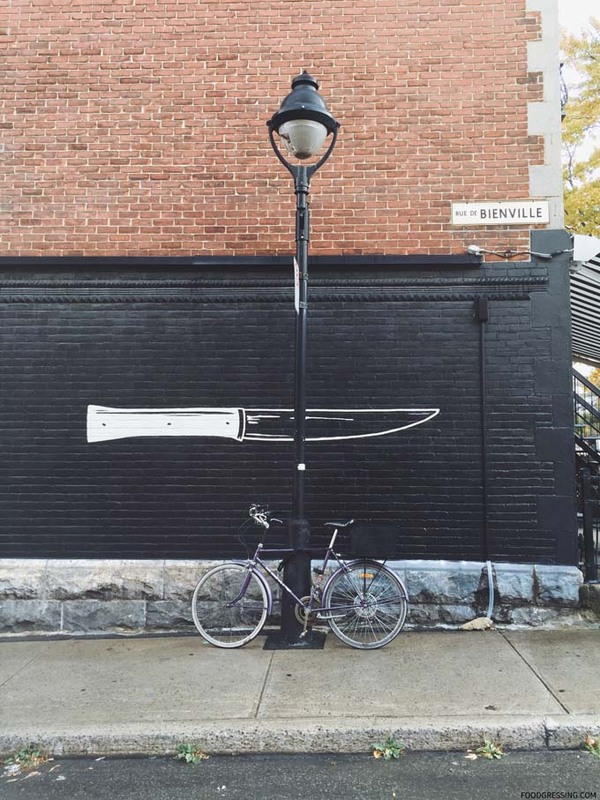 I had read that Carousel Bakery was a go-to-place for the peameal bacon sandwich. 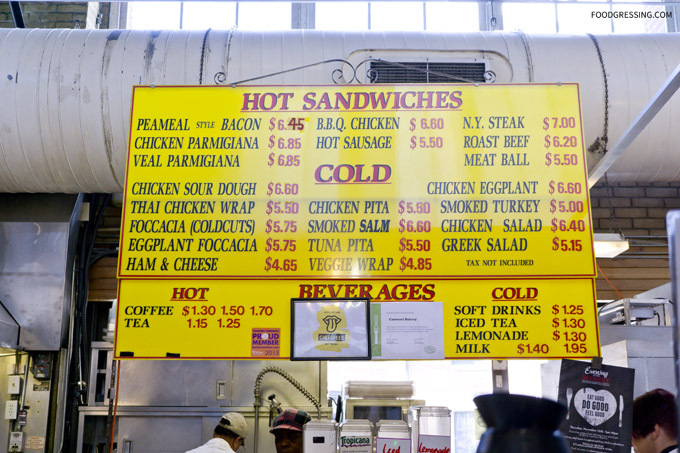 So, I ordered from this stall for my first peameal bacon experience. According to Wikipedia, the term “peameal bacon” is derived from the historic practice of rolling the cured and trimmed boneless pork loin in dried and ground yellow peas to keep it fresh longer. However, ground yellow cornmeal has replaced peameal since the end of World War II. 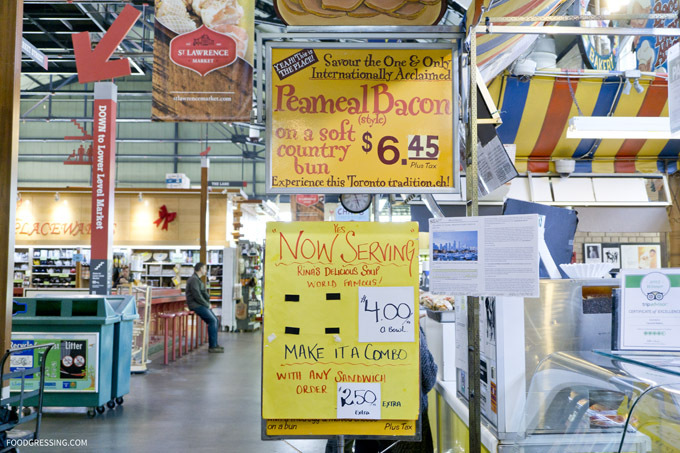 Peameal bacon sandwiches are thought to be signature dish of Toronto’s St. Lawrence Market. It is typically prepared by grilling the bacon in medium-sized slices until the centre is slightly rare and the cornmeal coating and external fat turns crisp. 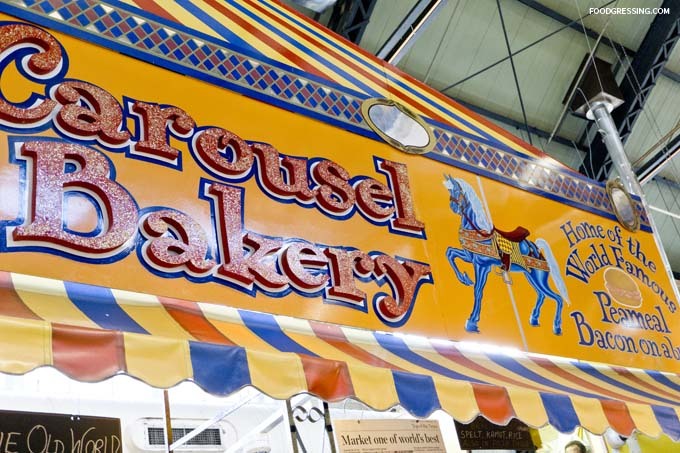 Located inside the St. Lawrence Market, Carousel Bakery stands out with its bold and brightly coloured signs. 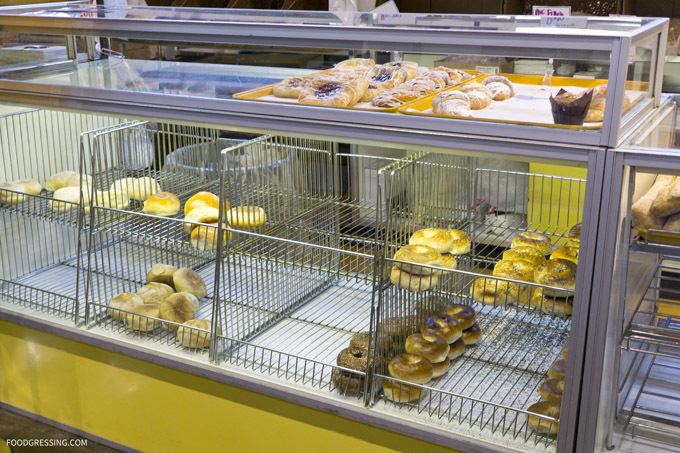 Apparently, on a typical busy Saturday, Carousel Bakery will sell over 2,600 peameal bacon sandwiches in one day. That’s one sold every 15 seconds! 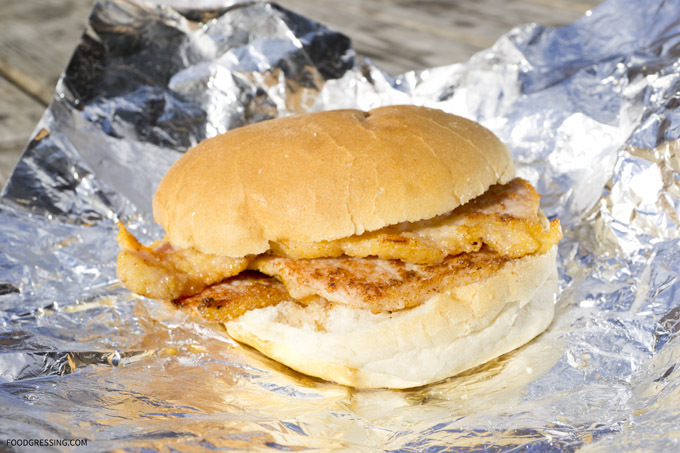 Here a peameal bacon sandwich is $6.45. 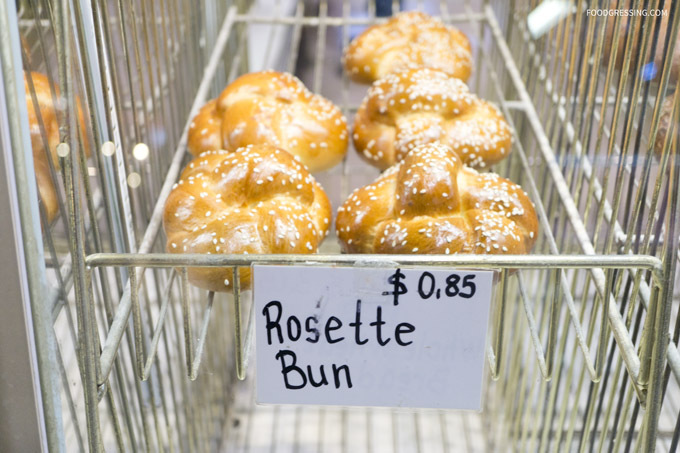 Carousel Bakery also offers other types of sandwiches, soups and baked goods including bagels, tarts, and bread. 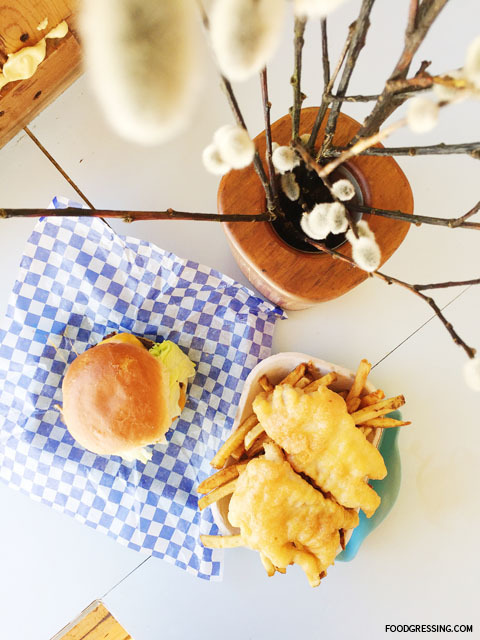 Carousel Bakery’s version of the peameal bacon sandwich is perfect for purists. That is, the sandwich is to be appreciated solely for the bacon; there are no other fixings like lettuces and tomatoes. There were four slices of bacon which were juicy, tender, a tad greasy and salty in a plain bun. The sandwich was pretty good overall though I think fixings would nicely offset the saltiness.